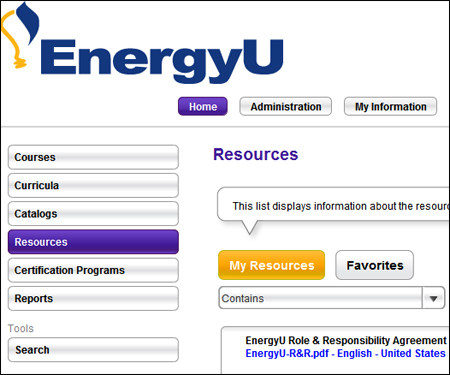 MEA has deactivated the EnergyU Role & Responsibility course and replaced it with a PDF form. The R&R only needs to be accepted once, so if you have completed either the form or the course in the past there is nothing additional you need to do. The new R&R form is available as a Resource to all administrators. From the user portal Home, select Resources to access the form. When adding new company administrators, please have them complete this form and return it to Robbin Moore. If you have not already completed your transition from the OLD 195 courses to the NEW 195 courses, this is just a reminder that the OLD 195 courses will be deactivated on December 1, 2015. You can identify old courses by the “o” prefix in the course title, and old certificates by the lower case “m” in the certificate name. If you have questions about enrolling users in the new certificate programs, or add the new courses to your curricula, please contact Technical Support at 651-289-9600 x106. Maintenance was completed on the following training course: ASME-1171 e-TNG Installation of Customer Meters – Large Commercial and Industrial. Important: When a training course has undergone maintenance, it is important that users ensure a status of Not Started prior to launching the course. As part of the 192 course update, the reset interval for certificates was also changed. This change came about as a result of a survey conducted earlier this year. The change from 30 days to 60 days will allow a bigger re-test window without requiring a reset by the administrator. Administrator enrolls user in certificate (MEA number). LMS automatically assigns corresponding course to user. User takes course and fails — Admin must RESET COURSE. User takes course and passes — Certificate program will automatically reset course 60 days prior to expiration. If user must take course earlier (e.g. 90 days prior to expiration), Admin must RESET CERTIFICATE PROGRAM. Thank you to everyone who completed the survey. We hope you find this change in reset period helpful in administration of EnergyU. Questions? Please contact Technical Support 651-289-9600 x106.